This unique and quintessentially Indian herb is an investment for any urban farmer. Grow your own leafing herb kadi patta tree and it will be with you for life! 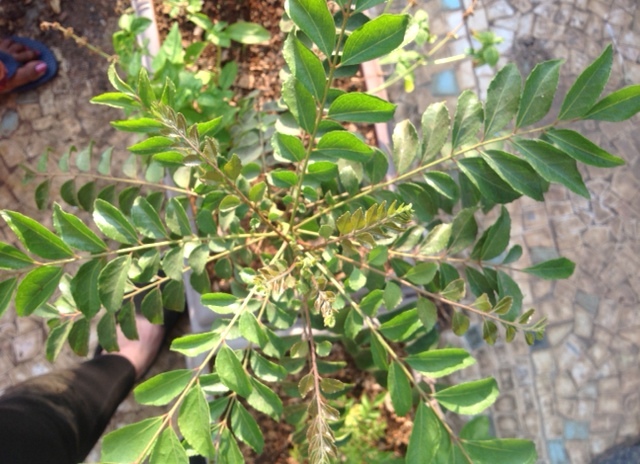 SEASONS: Kadi Patta is a perennial plant and well-suited to Mumbai’s tropical climate. It can be planted and will grow in any of our seasons. PROPAGATING: This plant is easily propagated from seed as well as from young ones, or “pups”, grown from the mother plant. GERMINATING: Sow kadi patta seeds at any time of year, but preferably when humidity levels are higher, during the monsoons. Since the seeds are hard-shelled, scarify them and sow in 1/2 inch holes in soft, well-composted soil. Place in semi-shade and water daily. Shoots will emerge in 7-15 days. PLANTING OUT: Transplant kadi-patta seedlings or re-plant young kadi-patta pups when they are sturdier in stem after about 2 weeks of growth, or when its first true leaves emerge. Choose slightly acidic to neutral, well-drained and composted soil in direct and strong sunlight. If using containers then opt for a medium to large size container to allow room for growth. Kadi patta will grow well indoors or outdoors, in containers or on open plots. NURTURING: This is an easy, non-fussy plant to grow and requires little nurturing besides regular watering and access to strong sunlight. Do not over-water this plant and when you do water, ensure that the soil has fully dried out before adding more. Pinch off top leaves at early growth to encourage lateral stems and bush formation. Thereafter keep pruning to help your plant grow as wide as it is tall. This is a hardy plant and does not get preyed on by insects or other pests. HARVESTING: Harvest leaves as the plant grows. Kadi Patta is a long-lasting plant and you will not need to uproot it annually – just keep growing it! A gracefully unfolding kadi patta bush! Hi there! To answer your question: I would not worry too much about shading it. On the contrary, give it full sun so it can pick up quickly. An acidic soil base will do. Water daily. Give it some time and these conditions, it should pick up and do well.